The most important job of a high performance turntable is to provide the perfect playback environment for your records and cartridge. This means spinning the record at one constant, accurate speed. And making sure the cartridge picks up only those vibrations it is supposed to pick up -- those coming directly off the disc. Unfortunately, the cartridge alone cannot discriminate between the vibrations generated by the disc and those generated by outside sources such as speakers, tonearm, motor, and even footsteps. 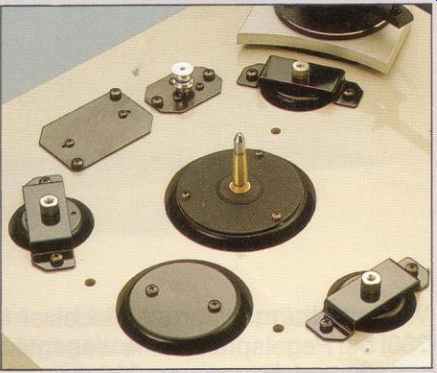 So, it is vital to any turntable design that the cartridge be totally isolated from all spurious vibrations -- those not coming directly from the disc. 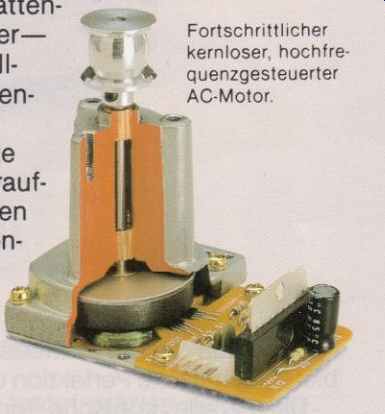 Above: Sine-wave AC motor used in HK turntables. This is where the new line of Harman Kardon turntables achieves unmatched success. We've concentrated on improving the areas that directly affect play back accuracy: platter mass, drive system, tonearm design, and suspension. The result is a line of high-performance turntables that offer you ascending levels of design and performing excellence. Above: "Under the hood" (below the platter) lies impressive suspension, motor, etc. All Harman Kardon turntables incorporate our own precision belt-drive system. Although there is a trend toward direct-drive motors in moderately priced turn tables, we have concluded that the belt-drive system is superior. In a belt-drive system, the belt acts as a vibration damper, filtering out the vibrations caused by the motor itself. These findings are supported by the fact that makers of the industry's most esoteric and expensive equipment have always been incorporating belt driven systems into their turntables. We also discovered that the more massive the platter, the better the performance. 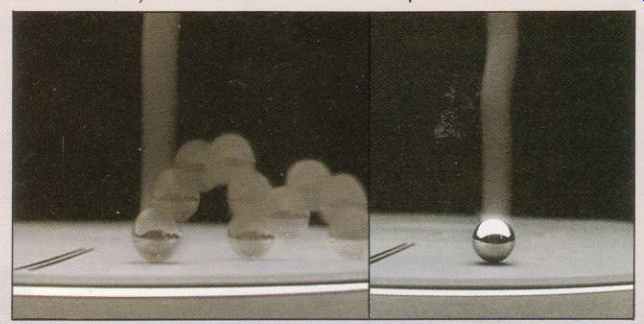 The concept is simple inertia: mass in motion tends to stay in motion, the greater the mass the greater the tendency. Translated into turntable performance, a platter with a higher mass is less affected by outside forces and more inclined to operate at one constant speed (the speed you set it on). Consequently, when we made our platters, we made them massive. Each Harman Kardon turntable is fitted with a straight tow mass tonearm with an especially vibration absorbent, carbon fiber headshell. Tonearm and head- shell together have an effective mass of only 8 grams. Why a low mass tonearm? Because it tracks more accurately and reduces record wear. And, with the microrace bearing pivot, it better follows a worn, warped, or oft center record. By improving stylus-to-record contact, it delivers better sound. In addition, the 8 gram effective mass is calculated to keep resonant frequencies in the ideal 10Hz range. Too low to interfere with record music, and too high to react to vibrations. The tracking geometry, with a 216mm effective length, 18mm overhang and 25.5 degree offset angle, provide exceptionally tow harmonic distortion. In the interest of providing convenience without minimizing the proven advantages of the manual tonearm, Harman Kardon models T40 and T60 feature an optical sensor which lifts the cueing lever and shuts off power. The optical sensor is the only way to provide the convenience of auto shut-off without compromising the clear, uncolored sound of a manual turntable. Other approaches incorporate mechanisms which, technical reports show, bring unwanted vibration to the tonearm and cartridge body. The frequency response of moving magnet cartridges is sensitive to load impedance, which is why cartridge manufacturers specify what their optimum impedance is. If you can't adjust for it, your cartridge could suffer variations as high as + 5dB at 215kHz. A difference you can hear. At the turn of a knob, you can achieve optimum cartridge performance, no matter what cartridge you choose. Originally, platter mats were only used to protect records from being scratched by the platter. To do this, any soft material of any thickness was sufficient. But recently, it's been discovered that different mat designs improve vibration damping and enable slightly warped records to lie flatter and shimmy less during play. The T40 and T60 take advantage of this advanced thinking in two ways. First: the platter mat on both models is made of a unique vibration absorbing high density compound. 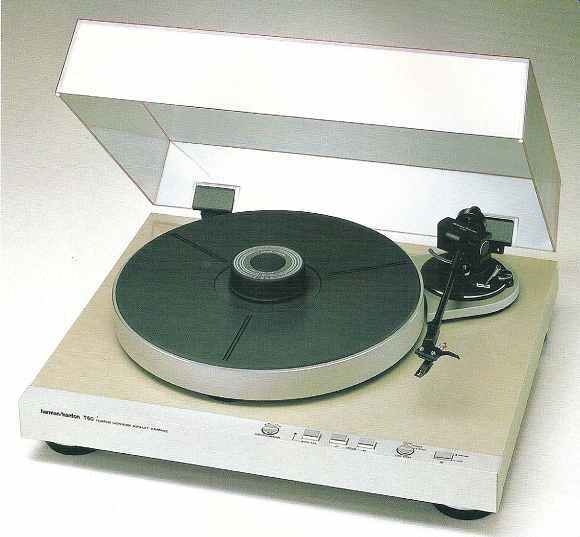 A compound that completely isolates the record from platter vibrations. The mat on the T40 and T60 is so energy absorbing you could even drop a metal ball bearing on it and the ball bearing wouldn't bounce. Both the T40 and T60 also include a disc stabilizer -- a balanced metal weight that fits over the platter spindle. The disc stabilizer firmly holds the record against the platter mat, flattening warps and preventing any movement of the disc during play. Altogether, Harman Kardon the accuracy you want, while and distortion you don't want. Compare each Harman Kardon turntable against any other in its price range. You’ll find that when it comes to delivering the kind of sound you expect from a high-performance turntable, there is no better value anywhere. In our quest for sound that is totally isolated from outside interference, Harman Kardon introduces its top-of-the-line T60 auto-lift turntable. At the heart of the T60 is a belt-driven, quartz-lock DC servo motor that turns the heavy 3.3 lb. platter at an ever-constant velocity and an inaudible level of rumble. That same platter further isolates your records from vibration with a rubber damping ring underneath and an acoustically absorbent platter mat on top. Then, the platter and the low mass tonearm, unique, 3-point, free-floating counterweighted suspension system. In addition, to allow truer transmission of this almost perfect sound to your speakers, the ultra-low capacitance wires leading from the T60 have gold plated plugs at each end. There's also an auto-lift feature. It's an optical sensor that triggers the cueing lever, raises the manual tone arm and shuts off the T60 at the end of record play. Last, but far from least, there's an unusual feature no other manufacturer offers: capacitance trim. It allows you to tune your cartridge perfectly to your system, which optimizes cartridge performance, and provides ruler-flat frequency response. All in all, the T60 adds up to a highly unusual, high performance turntable.